Alexander Boyd was a small landowner in Union, Green County, Alabama. Boyd was the nephew of William Miller, a probate judge. Prior to the Civil War Boyd was convicted of killing a young man named Charner Brown. His sentence was commuted to one year by Alabama governor John Winston. After his release he moved to Arkansas. Following the Civil War Boyd came back to Alabama and ran for county solicitor and register in chancery in 1868 and won. On the morning of December 10, 1869 the badly mutilated body of Dr. Samuel Snoddy was found. He had been robbed of a considerable sum of money. Sam Caldwell, Henry Miller and Sam Colvin, all African Americans, were accused of the crime and were held in the jail in Eutaw, Alabama. The death of Dr. Snoddy outraged the local white population. When Caldwell, Miller and Colvin were released by Boyd they were seized and executed. Supposedly, Solicitor Boyd was not too concerned about finding the murderers of Dr. Snoddy but announced that he would have the murderers of the three men arrested and would vigorously prosecute them. Solicitor Boyd, who was a bachelor received threatening notes and moved from an office at the court-house where he slept to the Cleveland Hotel across the street. On the evening of May 31, 1870 at 11:30pm, forty or fifty hooded men stormed the Cleveland Hotel. They demanded that the front desk clerk take them to Boyd's room. After pointing to the door the clerk fled. A few seconds later an agonized scream followed by several gunshots were heard blocks away. Solicitor Boyd was shot in the head two times and had several bullet wounds to the torso. There was no effort made to arrest the murderers and Alexander Boyd was buried the next day without receiving the usual testimonial of respect from his legal brethren. Not one of them attended his funeral. Mr. Boyd's tombstone in Mesopotamia Cemetery, Eutaw, Alabama was erected by his uncle William Miller and is inscribed "Murdered by Ku Klux". 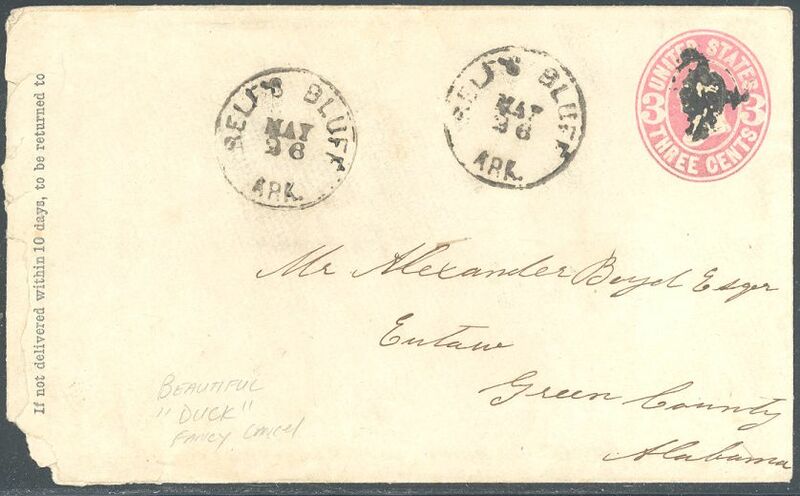 I purchased the cover below of Scott U58 addressed to Alexander Boyd Esqr. at my local club auction for one dollar. Not knowing the history of Alexander Boyd, I was more interested in the "Duck" fancy cancel, which I am still researching. The origin postmark is also a puzzle to me. I cannot find any information on what appears to be Self's Bluff, Ark. Because there is no year on the circular date stamp I am curious if it is 1870. If so that means that this letter was mailed 5 days before his death. Did he get to read it? I would like to hear from anyone who has more information about this cover.